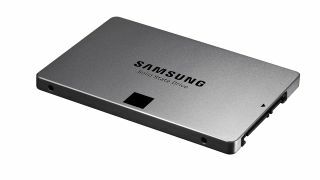 Samsung has formally announced the new Samsung 840 Evo series of SSDs, giving you a full terabyte of solid state storage for around 76 cents or 50p per GB. It's the first consumer-class SATA SSD with a 1TB capacity, a little case of one-upmanship over rivals Crucial and its M500 with but a paltry 960GB. Samsung is also offering the new 840 Evo range - a direct replacement for the standard Samsung 840 lineup - in five different capacities. As well as the standard 120GB, 250GB and 500GB drives it's also debuting 750GB and 1TB SSDs; all in the same 7mm high, 2.5-inch form factor. Not content with being big and good value - relatively speaking - the Samsung 840 Evo drives are also pretty darned quick too. We've been looking at the drive during an event we're attending in Seoul. We saw the 4K random read/write performance practically doubling over what the fastest SATA 6Gbps SSDs are capable of today. And what's the fastest consumer SSD today? Why, that would be the Samsung 840 Pro. Part of that pace will be down to the judicious use of a new write acceleration technology called TurboWrite. It apportions some of the drive's capacity to act as a lightning fast, simulated SLC buffer. It really makes a difference on the smaller drives, but will speed up the higher capacity 840 Evos too. The 4K random tests are a great benchmark for seeing how responsive a drive is at shunting around little bitty files, something your OS is probably doing right now. Those little files are the things that at some point will end up making your PC stutter, so anything that speeds up those operations is going to make for buttery smooth computing. Mmm, buttery smooth. It's something Samsung has made a focus of this new range of consumer drives, as it has the price. As well as creating all the key components for its SSDs, something few companies are capable of, it's the 3-bit MLC NAND Flash memory inside the drives that helps drive down the cost to the end-user. It may not be quite as robust as the 2-bit NAND in the Samsung 840 Pro series - hence the lower 3 year warranty with the Evo against the 5 year warranty of the Pro drives - but it is a good chunk cheaper to produce in higher capacities. So, what else is new? Inside there are those new 19nm Toggle 2.0 3-bit MLC NAND Flash chips and the new Samsung MEX memory controller taking them to task. There's also some interesting new software applications being bundled with the new Samsung 840 Evo series too. First there's the updated, simplified Data Migration 2.0 software, making it easier to clone your system disk onto your new SSD, then there's the Samsung Magician software. Inside that is the option to turn on RAPID Mode, and who wouldn't want that? It's a dynamic disk caching technology which utilises spare CPU and RAM capacity to boost SSD performance. At the moment it's limited to one CPU core and 1GB of system memory, but the demos look impressive. We're a little scared it all looks too good to be true, from some of the frankly amazing demo numbers we've seen, but we can't wait to get hold of the new software and really start putting the drive through its paces.